Step 1.) Correct the small stuff like Alt and Title tags (minor stuff). This stuff is only semi-important in James’ case because he already has hella people linking to his article on websites and social. Step 2.) Add more sections to the post based on the Google Suggested Searches at the bottom of the page. A free eBook is super easy to provide in this case. Just paste the post into a Google Doc and do File –> Download As –> PDF. 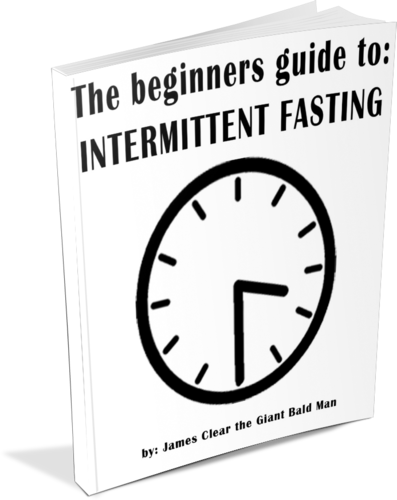 A free intermittent fasting guide. A 3 step plan to follow. That’s my quick assessment of James Clear’s post. As always, leave a comment with your site if you’d like it torn down! I save every entry for later episodes!! 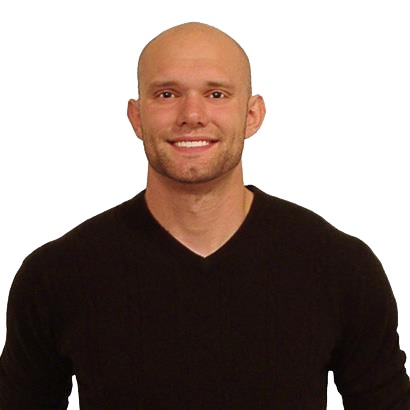 Leave your site in the comments to be torn down, or lemme know whatchya think! I’m a novice at copywriting, but am determined to make a living in the field. Constructive criticism of my site’s copy would be greatly appreciated. I’m Candy from PearlMountain Technology, a dedicated graphics software developer. I’m writing to invite you to do a review or write a piece of news for our newly-updated web app – FotoJet on your website. Your readers may be glad to know it. • Choose from 320+ templates for collage, photo card, poster and social media to get started. • Add photos and freely customize the collage as you wish. • Freely save collage as JPG/PNG or directly share it via Facebook. I sincerely hope you will consider reviewing our FotoJet favorably. If you need any material, please feel free to contact me. Thank you very much in advance. Added it to the list! Seems like a pretty cool & lightweight app Pat! We’ve got big plans and a lot of work ahead of us, but excited about it. We “launched” the application, but no one knew about it… which is sort of like if a tree falls in the woods, does it make a sound.. Concerning the course you give, I heard you said on one of the podcast I listened to it was 69$ before, is it the same thing or not? Second if I’m just interested doing the Drop Shipping stuff, will I be able to apply this course to my website(s)? you can have a look on the website, in my records, and please give me a feedback either here or PM. I would love some feedback. Eager to participate in this tear-down! Glad to see you at least putting some thoughts down on a WordPress blog! I am going to use thes tips. Thanks. Please tear my site down so I can see the before and after. Hey Kristi, you’ve been added to the list! However I’m not really sure what your page does?? Very confusing at first glance! Cool little niche you got there. Have you ever considered having a “one time help” consult? Maybe for like $100 or whatever people can rent your brain for an hour over video chat? That might work well for people using WooCommerce who might not need UNLIMITED help necessarily. Your site has been added to the list! I’m doing a whole page on consults next week and hopefully you like it! Thanks for the advice, Nev.
Coming from a web design background I’m actually steering away from consultation services. I’m leaning towards productized services and something more scalable. Hence the monthly subscription model. Although there’s definitely a segment of people looking for a one-off fix/advice. So there’s a space to expand the service in this direction. At this stage, I’m trying to get my first 15 customers to sign-up for this service. Love your style. I have been reading your stuff for the past 5 years. Just got the Kopy Write Kourse and I am hoping to get into it this weekend (please hold me accountable). Would love to have you tear down my site http://tryboon.com/. Don’t hold back! Hey Jared, hope you’re liking it so far! I’m thinking of actually doing a whole teardown on App pages, this might go in there! I work for Traklight and sometimes it’s difficult to find the right words for it, due to it having no competitors/no reference to pit against. Hey Maddie, you’ve been added to the list!! hey neville, i replied to your last email but didn’t hear anything back. jw if you have anything in your course about getting your first freelance copywriter gigs, or if you have any free advice. im sick of being poor cutting out pictures of cigars in photoshop for a living and am thinking of branching out. i love the copy teardowns. i hope this series keeps going. sadly, i dont have my own site to send you….yet. Hey Brian, glad ya liked! However if you want some advice about getting freelance copywriting gigs I wrote an entire huge page about that stuff WITH templates and everything! I love the pdf download tutorial in there. So simple. I keep thinking I need to hire somebody on Elance to do that. Saved me $$$ and hassle. Thanks. The stuff about the alt tags that you said was stupid simple, I don’t do. In fact, what the tech geek are you talking about. Yikes. I’m way behind on this stuff. Thanks Louise, you’re added to the list! You can definitely make free PDF’s with Google, it’s SOO easy. If you go on Fivver or Elance you can get someone to make it pretty, but honestly the information is more important than adding a bunch of random colors and junk. I like the variety here… how you did a marketing company site first, an email campaign second, and now an article. One note about the PDF export from Google Docs — any URLs in the document will be behind a Google redirect in the PDF. This can can sketch some people out if they hover a URL that’s a link and it actually displays a different URL. It’s a GREAT way to quickly generate a PDF, but has at least this one limitation to consider. I have not yet found a good workaround for this that is as easy. I’d still love to see a kopy teardown of an iPhone app landing page! There’s also this one for an app I made: http://www.getphotofind.com/ — Based on your feedback I’m actually doing an Unbounce test on this between some long and short copy versions, as well as with and without a video (you can use incognito windows if you want to check out other variations). Thanks Neville! My team and I look forward to number 4! Oh nice John! Both are on the list. It won’t be number 4….but I’m planning on doing an iPhone app landing page review, as I’ve helped out with several of them. This way I can use them as real case studies when I feature them!! Oh, I do like that EBook idea, so easy, so obvious! 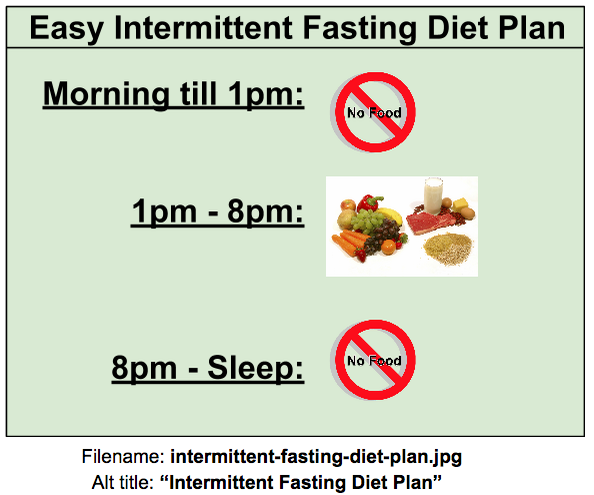 Will implement this week. ALT tags are also great for accessibility, blind people using screen readers will know what you’re talking about, good all around! Oh wow, I never even thought of the alt tag problem helping blind people…extra bonus!! Hmmm…..life coaching eh? I’ve put you on the list! I’ve got a bone to pick with life coaches, so maybe I’ll do a teardown of them at some point! This post alone is worth everything I paid for your copywriting course. Keep up the good work you Asian MoFo. [Product] + [Local Area] is always an interesting SEO opportunity. -Good job on putting your phone number everywhere. That’s the most important element of your page, GETTING THEM TO CALL! -You might wanna submit your business info to Google Local Listings. Add your business name, what you sell, phone number etc. This will give you extra exposure in the online version of the Yellow Pages. Very important for local businesses. Just make a video showing a few of your installations working and a number to call. Usually videos have a better chance of it making to the top of search engine results. Great bite size valabel info. I got 2 great takeaways (alt image tags and googles suggested searches) that I will use on a client project today. How do you feel about adding such suggested searches (and then add answers like you showed in the video) at the footer of a website to improve ranking? Thanks! Hey Mick, I don’t know if I’d do it on the footer, as that seems weird. Cool. Thanks for the reply. yup! I’m actually going through a post I’m writing now and adding suggestions based off this! emails which is no doubt also great. But he lack in some online marketing strategy. Let’s optimized his blog for marketing strategy. Step 1. Install Custom audience. This is just like GA code. 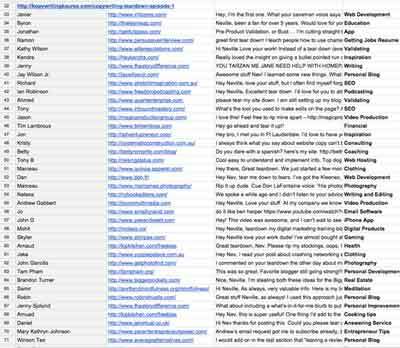 You put it all of your website pages so that you can reach these people through fb advert. Step 2: Create a re-engage plan for those people who show interest in his courses and located in top tier countries. Again this requires custom audience code. Step 3: Create a re-engage plan for those people who visit his blog but do not sign up for newsletter. Step 4: Acquiring new visitors through advert at a regular interval so business grow in autopilot mode. That’s my quick assessment of Neville blog. Neville Leave your comments about it, or lemme know whatchya think! I’d be really curious about Neville’s thoughts on your website too because I find it freaking awesome. I was compelled to follow the link you posted and BAM! Totally hooked and read every single thing I could. Even the subtle personal branding is beautiful. Your picture is relaxing and inviting ( ok, I fancy you a little :-). Very straight forward and flowing info there. Two thumbs up from me. Thanks Alex, great to hear that… thanks! One of the things about your site (as well as other consulting sites) is that the website itself rarely seems to generate paying clients. It’s more word of mouth stuff. However your site seems to do a pretty good job of being nice & friendly & getting people to signup already. Now go start marketing your own stuff to other audiences so you can grow! Hey Nev, thanks for adding me to the list. What’s troubling me is the opt-in form copy which I think is a little bit weak (aka too generic), don’t you think? Hey Matteo…..maybe offer a SPECIFIC thing for them to download? ….then insert an image of the free checklist, but they can’t read the content. SOMETHING SPECIFIC is better than general vague “imma spam your email” stuff! Step #2.) is to get KNOWN!!! I’m writing a post on this right now! Great little breakdown of an article I’ve read about a bazzilion times. Hahhaha, yea I’ve actually stumbled on it a few times just by the nature of it being the #1 result. Imagine how much extra traffic comes from holding that position!